Whether establishing a “presence”, in order to protect travelers from hostile Indians, or using its thousands of square miles for the training of its personnel, the U.S. military has been connected with the California desert for nearly two centuries. Even today, traces of these installations remain. The year was 1859. During that year, a Colonel William Hoffman and the 60 soldiers under his command stopped for water at Piute Spring. Apparently deciding to make a stand against some hostile Indians, Hoffman had about half his men shoot at the Indians, killing roughly 20 of them. The rest ran off. Several months went by before Major James H. Carleton and his 1st Dragoons came through this area and established an actual post, which he named Fort Beale. The name was in honor of a Navy officer who had previously led an experimental camel caravan through the area. Although called a ”fort”, the Piute Springs outpost was really just one of several desert ”redoubts” -- ie, temporary fortifications that were established in order to protect travelers along the Mojave Road against the hostile Indians who frequently stole livestock from and murdered them. Not surprisingly, the troops stationed at Fort Beale were transferred east at the start of the Civil War. Clearly, and probably correctly, the Army’s priorities lay elsewhere. While the war raged on in the east, Fort Beale and the other installations were manned by soldiers of the California Volunteers. These were state militia men who had not been ”Federalized”, and who stayed in California to protect the roads. Despite the presence of the California Volunteers, thefts of settler’s livestock continued. When the Civil War ended, however, the desert redoubts were abandoned. Complaints from local settlers, and the fact that the Mojave Road was a U.S. Mail route, prompted the U.S. Army to re-occupy the posts in 1866. At this point, Fort Beale was renamed Fort Piute. Life here was tough for the soldiers. Aside from the dangers of combat, the men lived in tents full-time, because the fort itself was intended to provide cover and a place to retreat to during combat. In addition, the soldiers ate all of their meals outside. Given the remote location and harsh environment, desertions were not unheard of. 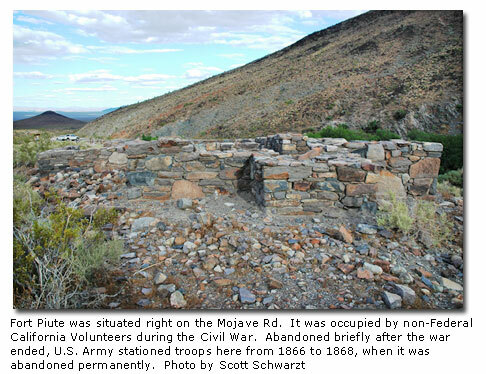 Perhaps it is no surprise that Fort Piute was abandoned again -- this time for good -- in 1868. 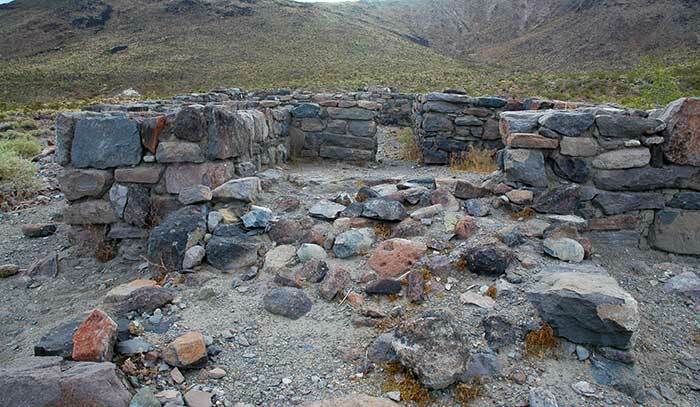 The remains of the stone blockhouse that was once Fort Piute are still standing today. Plus, the fort is positioned right near the Mojave Road, which is open to four wheel drive vehicles in this area. How could I resist a visit to this place? So, our ”convoy” of two vehicles headed north on I-15 from the city of Fontana, California. It was 9 am on a June Saturday. I was prepared for a very hot day, but a high overcast was keeping the temperature at a reasonable 85 degrees. We drove through Barstow and picked up I-40 east bound. 133 miles later, we were heading north on Route 95. We had driven only six and a half miles on Route 95 before I used my ham radio to call my friend in the other vehicle. I told him that I was pulling over to look at a historical marker that was on the right side of the highway. The marker indicated that this was the site of Camp Ibis -- one of the desert training camps established during World War Two by the U.S. Army. We got back in our vehicles and drove about a 1/4 mile past the marker. During the war, two armored divisions trained here. But now, nothing remains except the small rocks marking the roads that ran through the camp. After eating our lunch, we continued north on Rte. 95. It was only another 10 miles before we came to the cairn on the left side of the road. The cairn marks the point at which the Mojave Road crosses the paved highway. Now that we were off the pavement, I engaged my four wheel drive. As I do not like dust to get inside my vehicle, I kept my air conditioning on. The road was mostly level, but it was very sandy in spots -- especially at the two points where Piute Wash crosses the Mojave Road. Aside from occasional deep sand, the road was extremely rocky. This made it necessary to drive very slowly. In fact, I kept my transfer case low-range so that it was easier to control my speed here. Averaging 5-10 mph, it was a very long 8 1/2 miles before we came to the ruins of the old Irwin turkey farm. 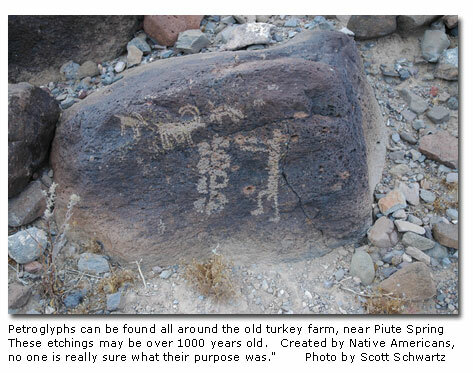 Located right alongside Piute Creek, the area was originally homesteaded by a Thomas Van Slyke in 1930. Von Slyke tried to make a go of growing fruit and grapes, but wound up selling the place to George and Virginia Irwin in 1944. 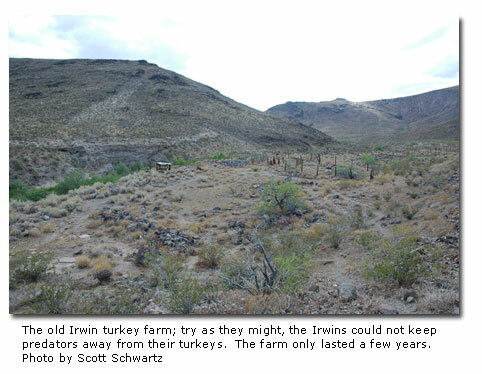 The Irwins built a home here and tried to raise turkeys. Unable to stop predators from getting into the turkey pens, the Irwins gave up altogether and moved away after a few years. As I walked among the ruins of the turkey farm, I thought about the Irwins trying to make a life here. I was alone, as my friend and his girlfriend had disappeared into the small forest of trees growing along Piute Creek. Petroglyphs can be found on nearly all of the rocks here. It is thought that these etchings may be over 1000 years old, and no one is really sure what their purpose was. I wondered if the Irwins had much time to contemplate such things. My pondering was cut short with the realization that it was getting late, and we still wanted to get to Fort Piute. I called to my two companions, and we got back into our vehicles. It was only another 1/2 mile before we reached the parking area at Fort Piute. I say ”parking area”, because the area surrounding the fort and the corral is closed to vehicular traffic. Visitors must walk to the fort, which is a short distance away. Upon reaching the ruins of the fort, I stood and looked around. The fort is nestled in a valley. On this day, the surrounding hills were still green from recent rains. Rays of sunlight, coming through the clouds, accentuated the shadows on the hills. Initially, I considered that being posted to such a beautiful spot could not have been too bad. But then, I didn’t have to live, eat, and get shot at here. The National Park Service has placed an information kiosk at the site, and visitors are free to walk through the foundation of the old fort. However, climbing, walking on, or sitting on the walls are discouraged, as these activities contribute to the deterioration of the structure. The stone foundation is all that left. The walls seem to be about 5 feet thick, and it looks like there were at least three rooms. The ruins of the fort’s corral are located nearby. The path between the fort and the corral was once protected by stone walls. On the day of our visit, we were the only ones at the site. The only sound was that made by an occasional bird. I could not help standing next to the stone ruins and imagining life as a soldier here. Despite the area’s beauty, the prospect of being killed or wounded here, miles from civilization, could not have been a pleasant one. Feeling a momentary chill, I looked up at the sky. The sun had not yet dipped behind the hills, so the temperature could not have dropped very much. Still, I figured that it was time for us to head home.